Set against a representation of much of rural America as an impoverished and socio-economically abandoned space, reaching out in desperation to the populism of Donald Trump in the 2016 US Presidential elections, this paper seeks to probe more critically and carefully the everyday geographies (represented, practiced, lived) of this space. It does this through engaging its artistic expression within a branch of Country Music known as Americana and, more specifically, through the American West articulated in the songs of musician and author Willy Vlautin, expressed by his bands Richmond Fontaine and the Delines. The paper shows both Americana in general and Vlautin’s songs in particular to predominantly present a bleak and brutal picture of what is termed ‘abandoned rural America’, depicting rural to small-city lives destroyed by both ‘internal’ and ‘external’ forces. 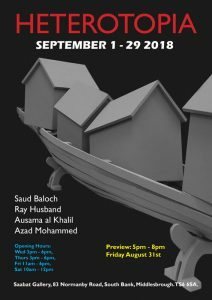 Moreover, this grim condition seems little assuaged through the kinds of residential migration and more everyday mobilities that may be associated with the West’s Frontier myth of salvation or today’s supposed era of mobilities. However, through a Gibson-Graham inspired reading for difference and sensitised by Neil Campbell’s idea of an affective critical regionality, an alternative story of a more positive if fragile rural geography can be identified. Vlautin’s songs well express this geography of hope as rooted in recuperative liminal but often deeply emplaced ‘pauses’ within a gruelling everyday life-course. Indeed, the abandoned rural West can be seen to present heterotopic existential life-rafts to its ‘drowning’ people, a position rural spaces today can be seen to adopt more generally, expressing, in sum, an affective critical rurality. 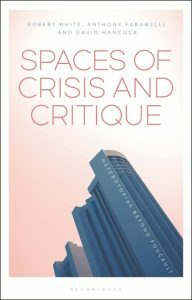 White, R. G., Faramelli., A. and Hancock, D. (2018) Spaces of Crisis and Critique: Heterotopias Beyond Foucault. London: Bloomsbury Academic. In Of Other Spaces Foucault coined the term “heterotopias” to signify “all the other real sites that can be found within the culture” which “are simultaneously represented, contested, and inverted.” For Foucault, heterotopic spaces were first of all spaces of crisis, or transformative spaces, however these have given way to heterotopias of deviation and spaces of discipline, such as psychiatric hospitals or prisons. Foucault’s essay provokes us to think through how spaces of crisis and critique function to open up disruptive, subversive or minoritarian fields within philosophical, political, cultural or aesthetic discourses. This book takes this interdisciplinary and international approach to the spatial, challenging existing borders, boundaries, and horizons; from Claire Colebrook’s chapter unpacking the heterotopic spaces of America and Mexico that lie beyond reductive ideological spaces of light and darkness, to a Foucauldian reading of the Zapatista resistance. With essays on politics, philosophy, literature, post-colonial studies, and aesthetics from established and emerging academics, this book answers Foucault’s call to give us a better understanding of our present cultural epoch.